Frozen Mountain IceLink v3.2.5 allows you to embed voice and video communication into your web applications. The IceLink SDK enables application developers to add two-way audio/video and data streaming to applications. IceLink provides a single API that can be used for Chrome, Firefox, Opera, Internet Explorer, Edge and Safari, as well as for native iOS, Android, Windows and Xamarin applications. With IceLink, WebRTC anywhere becomes a reality, and you can begin developing applications today that make use of peer-to-peer audio, video, and data streaming no matter what browser or platform is involved. 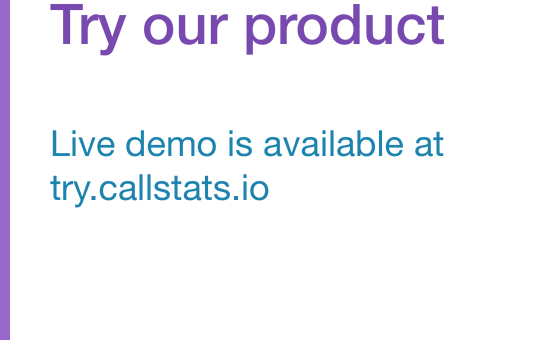 Follow the simple steps below to integrate the IceLink SDK with callstats.io. You are all set and your endpoints are now being monitored. Founded in 2008 and having grown to over 400 customers in 51 countries worldwide, Frozen Mountain Software provides cross-platform, licensed internet based real-time communication solutions and services that allow organizations to incorporate WebRTC audio/video streaming, selective forwarding, audio/video mixing, screen sharing, call signaling, telephony, broadcasting, text chat, shared whiteboards, browser synchronization and internet pub/sub messaging into their applications. Learn more at www.frozenmountain.com.